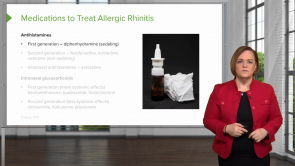 Allergic rhinitis and cough are commonly encountered in respiratory diseases. Asthma and COPD are chronic respiratory illnesses. As a nurse, you need a good understanding of treating them with the right medications. In this online course, you will learn how to suppress coughs and treat the most common disorders of the respiratory system, and the importance maintenance and of rescue medications in an acute bronchospasm.